6 What are others Saying about the TR3000i? Its not every day that you get such a good product to review, the Lifespan TR3000i might just be one of the highest rated products we have ever seen. Sitting square in the middle of the LifeSpan range the TR3000i is the first model in the Lifespan range to offer a full speed running deck, and the engineering quality normally found in commercial machines. 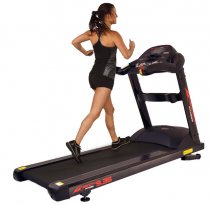 In common with other treadmills at this price, the TR3000i you will have no problems reaching the fitness levels that you are looking for. Whether that be for competitive sport, recreational running or cardiovascular improvements. No matter what level you start your training at the TR3000i can bring you along. The question is whether the Lifespan is better than the other options! Some of the little features help, all your workouts can be stored on the USB port enabling you to track your improvements over time. It has built in audio making the workouts pass quickly. 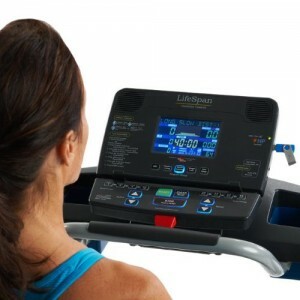 In addition all treadmill customers gain access to the LifeSpan Fitness Club. This is an online forum that works with the data you generate to suggest new programs to maintain your improvement. No worries about power here this machine packs a powerful 2.75hp unit. This has plenty of torque to push runners up the incline at the top speed of 12mph. At no time does the motor feel laboured or over used even on long workouts. The motor looks solid and well built, and with a lifetime warranty Lifespan don’t expect to see many faults. One feature I really liked for my cool down was being able to drop to just 0.5mph, giving you great control and allowing a safe warm up and cool down speed at the beginning and end of the workout. The full sized running area measures 20″ wide by 56″ long. This is not quite the longest track offered by LifeSpan. 56″ is adequate for full speed running by medium sized users. If you are taller (over 6′) you might want to consider a trade up to the 60″ option offered on the LifeSpan TR4000i. As with all the higher end models the TR3000i belt is two ply, for cushioning and longevity. It is also supported by 8 shock absorbers, this will limit damage to the joints and make a smooth comfortable running track. We really like the attention to detail in the programs offered by LifeSpan. There is a nice split of programs offering a total of 19 options: Weight Loss (5 Programs), Healthy Living (5 Programs), Heart Rate (two programs), Sports Training (Seven Programs). In addition to the pre programed options you can build your own workouts through the simple to use console. Finally, as if that is not enough, there are the personalised downloads from LifeSpan through their 4 month trial period in the LifeSpan Fitness Club. 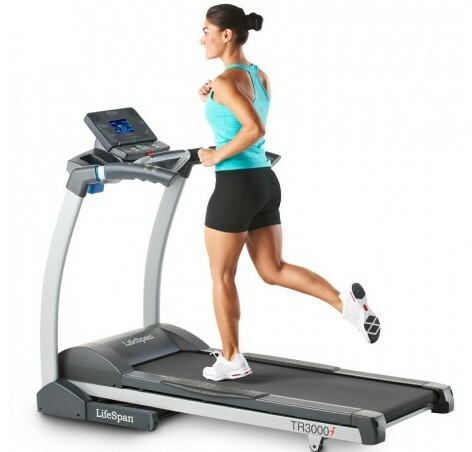 With its built in motor the Treadmill can change the ramp incline through 15 levels. This really pushes the workout to the next level as you are effectively running up a steep hill. You will feel this effort in your calfs and legs when you finish! Whats great is that the programs are integrated into the incline so you can keep you workout tempo up as the speed in inclines change. 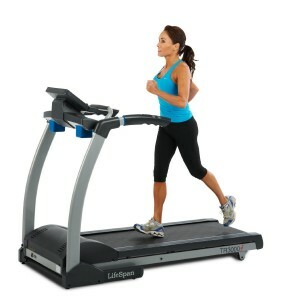 LifeSpan back this quality treadmill with a great warranty. Maximum runner weight is 350Lbs. 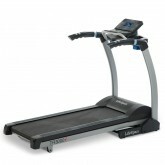 We like that you can perform high speed runs on this model. The next model down the TR1200i has a maximum speed of just 11mph. The compact form means that it does not need to dominate the whole house. There is little to criticise here. If we were pushing it 4 months on the LifeSpan Fitness Club is a little tight. If you are over 6′ tall you may prefer the 60″ belt. There is a built in heart rate monitor, but no chest strap is included. You can use a chest strap if you supply your own. What are others Saying about the TR3000i? This model from LifeSpan scores a massive 4.6 out of 5.0 stars from over 30 online reviews. Users really like the overall quality of the machine ” I was stunned at how quiet and solid it is”. The price is good to, coming in under $2000 you are buying a machine that will last for years. 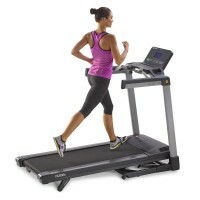 “Great Treadmill, probably the best in the price range”. As the entry level treadmill in the LifeSpan range, which offers a full speed motor and gym like quality this is hard to beat. It is strong, has great incline levels, and the preset programs are all anyone would really need. We really like the built in audio, which has good enough quality to be heard over the quiet motor. If you are a little taller then you might want to consider a longer TR4000i. 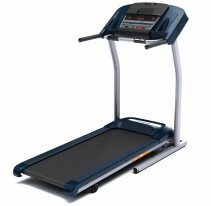 We really like this model and can recommend the LifeSpan TR3000i to all but the tallest runner. 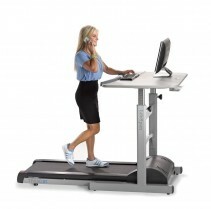 The tr3000i electric treadmill by LifeSpan has foldable and portable capability that turns this motorized running machine into a small compact size. 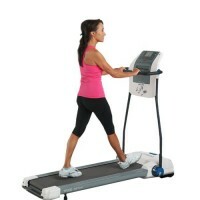 Heavy duty and high capacity 2.75 HP motor with a large 20" x 56" walking belt surface, and 15 levels of adjustable incline.